I seem to have had a half decent response to the game so I decided to devote another 6 hours to it. Click the QB Galaxians link in the menu to find the latest WIP version. Graphics for enemy and player explosions. Less prominent stars. They are nice and colourful now too. Some sounds which can be toggled with the S key. The sounds are for player shot, player explosion and enemy explosion. Font changed to a thick CGA font. QBGalaxians – Is it finished ? So I hit the 24hr mark and this is the result. I still think it needs more work but Im pretty happy with what is a working game. Select QB Galaxians from the menu to give it go. There was a distinct lack of interest in the tutorial so unless I feel the urge or someone expresses an interest it has gone on hold. 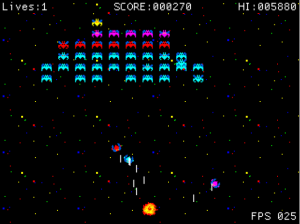 The asteroids game… well… I have lost interest in that too… no one else seems to be interested either so no loss there. I feel I have learnt it enough to give a go at writing something with it. 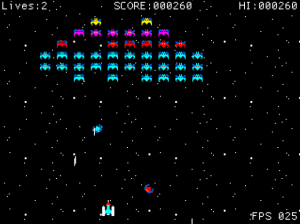 I have decided to try writing a galaxians game with it. Rather imaginatively I have decided to call it QBGalaxians. Who says I lack imagination !? I have also decided to try doing things a little differently this time. The whole project is run as an Agile project. Given the amount of spare time I have I figure 6 hours of work per Sprint sounds reasonable. I can get that much work done in a week. I have also given myself a deadline. I have limited myself to 4 sprints. The comes out as 24 hours work. The whole game has been broken down into stories. A story can be anything from a 15 minute to a 2 hour coding task. I pull in 6 hours of work per sprint of work. When coding I will not deviate from the list of stories. No sneaky extra features. With everything time boxed I cant afford to faff about. To ensure I dont get carried away I have restricted myself to finish the game in 4 sprints. 24 hours sounds like a nice deadline. I have just completed sprint 3 and it is looking pretty close to a finished game. If you want to see the progress click here to run the html5 build of it. 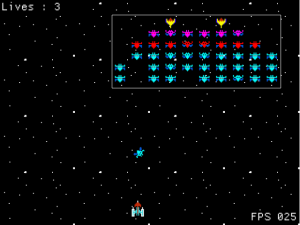 Once you are in the game use the cursors keys to move left right and Z to fire. Work is about to start on the fourth sprint. I have had to be pretty brutal to pick what makes it into the game and even more brutal in this last sprint to ensure I pick the absolutely necessary stories. It wont be the perfect game I initially envisioned. If I am going to be honest if I were to try and get it all written then there is every chance it would never get released. It will however be finished. If I feel like it or if anyone expresses an interest in the game then I may run more sprints to enhance the game. Otherwise I will move on to something else.